Several months ago I was thumbing through the Facebook page for Harborside Health Center. I’ve worked with Harborside for a long time so I like to keep up on what my friends are doing. 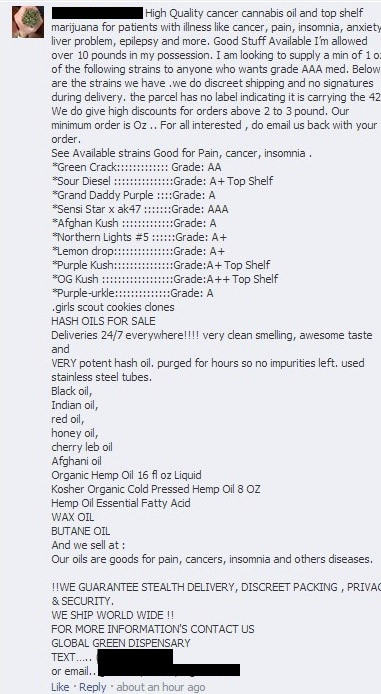 As I was scrolling through the posts made by others on their Facebook wall I noticed an advertisement from someone selling about 20 different strains of marijuana. I’d seen a few of these ads popping up on various Facebook pages and blogs that I frequent but for me it was still a fairly new phenomena. Not for Harborside. Thinking it would be helpful I shot a message over to my friend Morgan, who is Harborside’s amazing Social Media Manager. But I should have known better. By the time I’ve seen something Morgan has already been dealing with it for a while. Me: Somebody’s trying to sell O’s on yesterday’s Blueberry Kush post. Morgan: Somebody is ALWAYS trying to sell O’s on our posts. I delete them and ban them, but they eventually come back as another user. Well duh, why wouldn’t people be selling weed on a Facebook page with an audience like that? Dummy. Not a week after my exchange with Morgan, I started noticing the same spam popping up on various cannabis-related Facebook pages that I administer. Taking Morgan’s sage advice I started deleting and banning, but right on cue the posts would pop right back up under a different name, and truthfully there’s really no way of knowing if we are seeing new sellers showing up, or if it was the same user creating new accounts to post under. Besides the spam there was a deeper issue here though. Unlike most spam (Facebook or otherwise) the products being advertised are illegal in most states, and shipping and receiving marijuana is another charge that makes buying marijuana online a risky proposition altogether. It also opens up legal questions, such as what is my legal responsibility for removing these types of posts? If they are allowed to remain and people buy marijuana online have I facilitated a drug transaction? Going even deeper, though, there is also a moral issue, and the fact that so many weed dealers are popping up online indicates there is a huge demand for their product across the country and the world. Indeed, many of the people we deal with online through our not-for-profit organization, Healthy Hopes, are in desperate need of cannabis and cannabis extracts to treat their illnesses, their cancers and their mental health problems. So I started wondering what sort of a roll these Facebook dealers play in the medical marijuana supply chain in areas where marijuana is illegal (just because it’s illegal doesn’t mean it’s not medical). After a few months of deleting these posts I thought it might be a good idea to attempt to get to the bottom of how much money was actually being made (and if patients were actually being helped) by spamming Facebook, blog comments and forums, so I thought it would be a good idea to interview someone who makes their living doing just that. To my surprise it didn’t take long to find a willing participant, someone who posted an ad on our Facebook page that promises flowers, oil, wax and pretty much everything else one might find for sale in a legal dispensary. So I asked “Brandon” if he would mind answering some questions and he gladly accepted. Sadly our interview was restricted to Facebook messaging, as Brandon was hesitant to hop on the phone with a total stranger whose intention it was to ask detailed questions about his criminal operation. I get that. WB: How did you come to sell weed on FB? How long have you been doing it? Brandon: I was informed by a friend in Colorado and i’ve been doing this for the past 2 years. WB: How’s the profit compared to selling in person? I would assume you have a much larger market doing it that way? Brandon: Yes there’s more profit when i do Biz on Facebook as I get buyers world-wide. WB: Do you sell elsewhere online or just Facebook? TOR, etc. Brandon: I wish to sell on other sites but for now I just do this on Facebook. WB: What percentage of the product you sell do you grow personally? WB: How do you ensure safety for both you and the client? Have you ever been arrested or had any close calls? Brandon: I do overnight shipment via Fedex Courier Service Or UPS and the agency provides tracking number for any delivery so clients can track their parcel to know the present statues and arrival time. I ensure that all packages are shipped with maximum discretion to all our client, so your parcel will be registered as a discreet parcel so the Custom doesn’t get involved. The parcel will be dropped at the location you will provide to us. No signature is involved. WB: Is recreational or medical marijuana legal where you live? Do you want to give your location? Brandon: I’m from Santa Fe , CA and weed was legal there but i’m currently in Wilmington , DE where medical marijuana is still illegal. WB: Do you provide any product (flowers or concentrates) to patients in need that can’t afford it? I asked Brandon if he would be willing to share how much money he makes selling marijuana and oil on Facebook but he politely declined to answer, so we’re just going to assume it’s more than a little bit. doctor-patient confidentiality laws (HIPPA compliant)” Brandon offered. “Your privacy is our top priority and will never be shared.” In fact several statements Brandon made led me to believe that the operation he is involved in is probably much larger than just one man (or woman, we never got to that question) posting on Facebook. In fact, so many of the Facebook and blogspam ads for weed look so much alike that it would hardly be surprising if they boiled down to just a few large brokers who find internet marketing much more appealing than navigating the gauntlet heading south on 101. But is buying weed online safe? And that is the $64,000 question. The official answer is that buying marijuana online and having it shipped to you is a Federal offense, one that you could very well go to prison for. And then there are folks like “Kelly”, a grower I know in Sacramento, that have no qualms about what they are doing, believing that the mission of bringing medicine to sick patients is much more important than the risk involved. Kelly dutifully trots to the post office three days a week to drop his double shrink-wrapped flowers and oil into a collection bin, where the government-owned delivery service then takes over and takes it to the patient’s door for him. There’s no way of knowing how much money is being made by selling marijuana online, but anyone that lives or does business in the Emerald Triangle knows it’s a LOT, and that’s before we even start counting the East Coast basement and commercial grows that are contributing to the black market supply chain, plus what comes out of states like Colorado where not everyone is using RFID tags to track every gram of product. It is also not hard to find someone that has been ripped off purchasing marijuana online, which should give anyone who is thinking of making an online purchase something else to think about. In the end it comes down to your circumstances, the level of risk you are willing to take and the intel you have done ahead of time. There are ways of buying cannabis online where you can substantially reduce your risk, and I know desperate patients that have successfully done so. But until there is federal legislation in place that allows such a practice (or patients in all 50 states have safe access to medicine), people who do so are playing with fire and risking arrest, imprisonment and losing their hard-earned money. I wonder what would happen if the feds made the time and effort to pursue website owners with this type of activity. I think that’s a fantastic point. What I found out after looking into this is that most of these posts are just straight-up scams intended to separate people from their money because….well…who would one report an internet rip to? 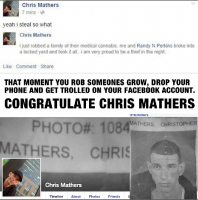 For the ones that are legitimate and that are doing it locally, they do often get busted. As for the culpability of the website owner, I am not sure that simply being negligent and failing to remove a post that offers illegal products is enough to create a problem. If so the guy that started Craigslist would have been electrocuted while being given a lethal injection by now. I’m one person among many that lives in horrible pain and have been approved for a low THC CBD card in Georgia I have so many questions that I can’t find the answers to.